Over spring break we took on a “little” paneling project in our entry hall and loooooong hallway (when I say long, I mean it is loooooooong – I’ll measure it and get back to ya’). 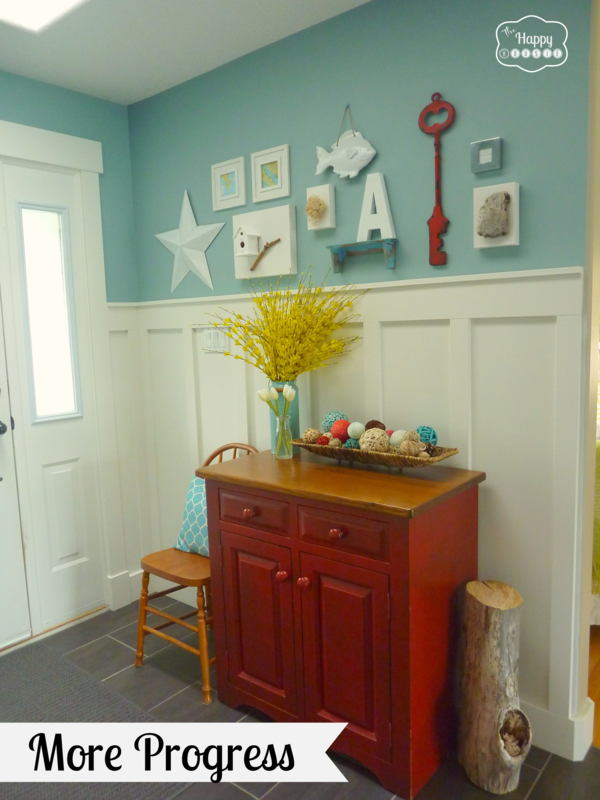 We did the same style of board and batten paneling as we did in our Ensuite revamp. 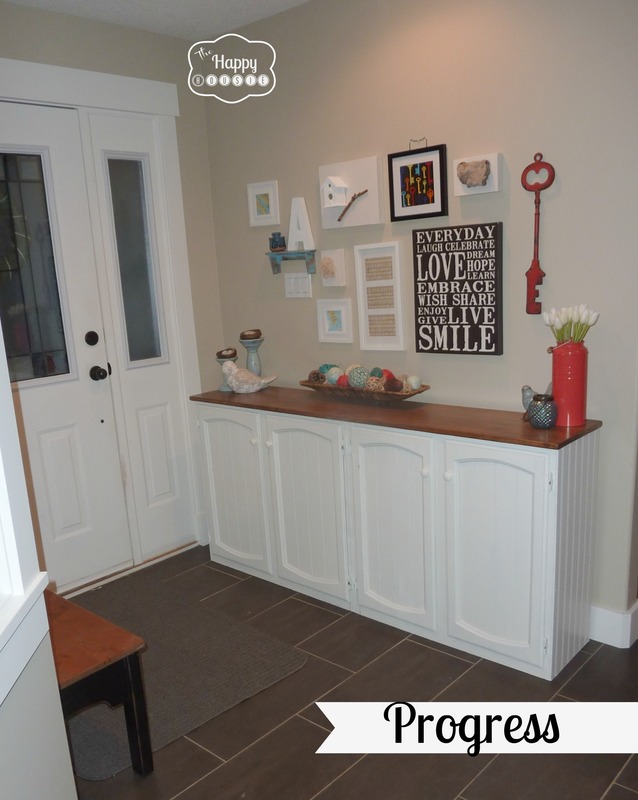 I will be back really soon with a detailed tutorial on how to install board and batten yourself but today I will show you how things are looking now in the Entry Hall. There is a big skylight right above our entry hall, but it is attached to a long hallway that has absolutely no natural light. We wanted to add some interest and brighten up the whole area, so board and batten was our answer! We painted the paneling Cloud White and the walls above are Colorado Gray, both by Benjamin Moore. There are still several tweaks left in the room. I have one more little creation to add to the gallery wall. I am still trying to decide what to do with the chair (paint it? what colour? leave it wood? what do you think?). I also want to paint the inside of the door a fun color (yellow?? ), and I think a new rug would be an asset to the space. We also plan to add hooks along the other side of the wall. I will be back soon with these updates and with more about our hallway transformation. You are so talented ! Great Job ! Hello from Australia 🙂 I love this board and batten project in your entry. I would love to do the same in my entry. I cannot find the tutorial that you said was going to be posted. Can you please let me know where to find it. I would love any help that you can give me. Many thanks. Hi there, Found this post through pinterest. Love the B&B but can’t find the tutorial. Can you share what size boards you used? Looks like a 1×6 for top and bottom trim, 1x3s for vertical slats, and a 1×2 for the shelf? What is the door trim too? 1×4 for vertical trim and a 1×6 on top? Thanks! I need to write the tutorial on that Meghan!! Thanks for the reminder. We did use MDF trim boards – You guessed the measurements of all our trim perfectly – wow, what an eye!! I’m seriously impressed. And really, thanks for the reminder- I should get that up soon! I would LOVE to know what color blue that is! I love it! Thanks! Thank you Ainhoa! I will hop over there and check it out:) So glad you came by! Hi Emily!! Thanks:) So excited to see how yours turns out!! CONGRATS! You have been featured at The DIY Dreamer! 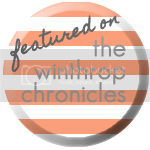 Come on over and grab your featured button, you deserve it! What a fabulous entryway! i love the board and batten and the new paint color looks beautiful! Thanks so much for sharing at Clean and Scentsible. I’ll be featuring this today. Happy Sunday! Hi Rose! I do love the improvement that the paneling has made. Thanks so much. I will hop over and check out your mat! Beautiful job! I’m looking forward to your tutorial because I’d like to do this in my dining room. Regarding the chair and door- go find yourself a colorful piece of fabric to choose your chair and door colors. The fabric can then be made into a pillow for the chair. Can’t wait to see what you decide. Great piece of advice, that is always what I tell people to do! I should have the tutorial up next week:) Thanks for your comments!! Beautiful! Great progress. Love how it matches you blog! Thanks! Ya, the blog design does match the house a little:) Thanks for hosting!! Hi Carissa! I will have to hop over and check yours out:) Thanks for your visit and comments today!! Hi Krista! Love it!! Wish we lived closer so you could come over…. I was thinking of you today as I was hanging some pictures… I am not good at this stuff! I have 2 questions for you; color schemes! How do you pick color out and arrange it so there is a flow to the home? And 2nd, picture arrangements…how do you organize pictues..? Thanks Krista! I love checking out your blog! Hi Krista!! Nice to hear from you! I think you have two really great questions… I think I should write about those on the blog because I bet lots of people have the same questions! When you say colour schemes do you mean paint colours? Or accent colours? Or both? Wowza! That looks ah-mazing! =) Thanks for sharing it at the Pinterest Power Party! Thank you. I am really pleased with how the board and batten has turned out. Now just working on some little tweaks to the entry hall! Thank you for hosting again, Nancy! 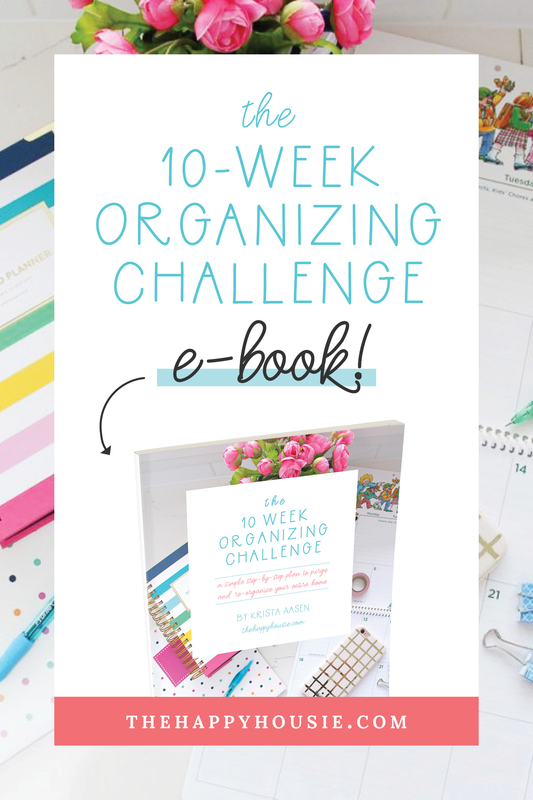 I love your party… such great ideas to check out! I love the transformation! The board and batten is so pretty! For the chair, I think I would either leave it or maybe paint it one of the fun colors you want to add to the space. SOOOO gorgeous! I love your color schemes! 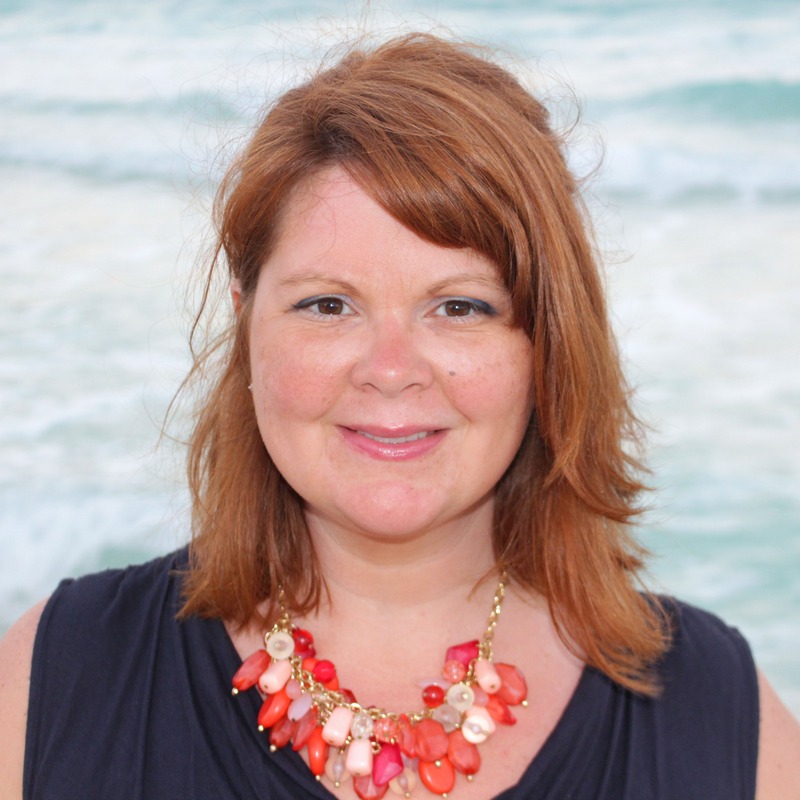 I would just LOVE to have you share this at my linky party! Thanks Katie, I would love to! Oh how I love a good B&B project. I keep thinking that I will do this, but I always chicken out of the work. I don’t think it would be hard. Just don’t want to do it on my own. 🙂 Anyways….are we still voting? It’s been a bit since you’ve posted this. My vote if it were my space, would be to paint the interior door yellow for cheer only if you really love yellow. Keep in mind, it’s spring now and yellow is delightful! I do love it myself. However, sometimes, I make decisions based on the season. How will that door look in Fall to you? 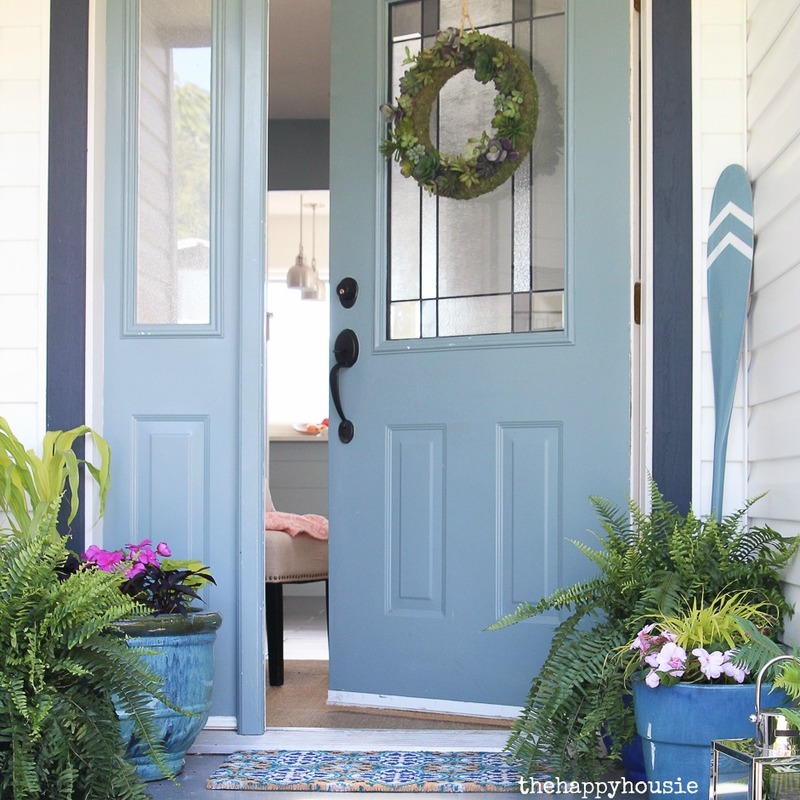 I did my door in a Springy color and thankfully, I’ve loved it in all the seasons. I think that it is because I just love the color itself. And the chair? I really like the softness the pillow adds. Ever thought of an upholstered chair? If that’s not in the budget, it may be fun to have it be a gray washed color? It’s tricky with the wood top of the red cabinet. Oooo! That red cabinet would be DARLING with some cutey knobs on it. Maybe something with yellow to tie in the front door? Phew, this is a long winded comment. Must be feeling chatty today! On a final note, I adore your tile! Hi Megan! Nice to meet you, thanks for your thoughtful comments! 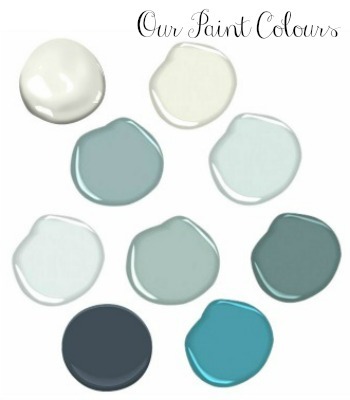 I agree – I often am influenced by the season for my colour choices!! Some really great ideas – you have totally given me some food for thought here. Thanks!! Beautiful! Love the colors and fresh look. Hi Sharon! Thanks so much… a few more colour tweaks to come too. Thanks Stephanie! So glad that you came by today. Board and Batten would look fabulous in the dining room… anywhere, really! Oh my! The colors are so fresh and gorgeous… I am a little envious, I must admit…..
Hi Crystelle! Lol, thanks for your kind comments… I will do a DIY Tutorial on it soon- pretty easy install and it sure makes a big difference in a room! Wow, what a difference! I love the blue and also the little pop of red! Thanks so much! 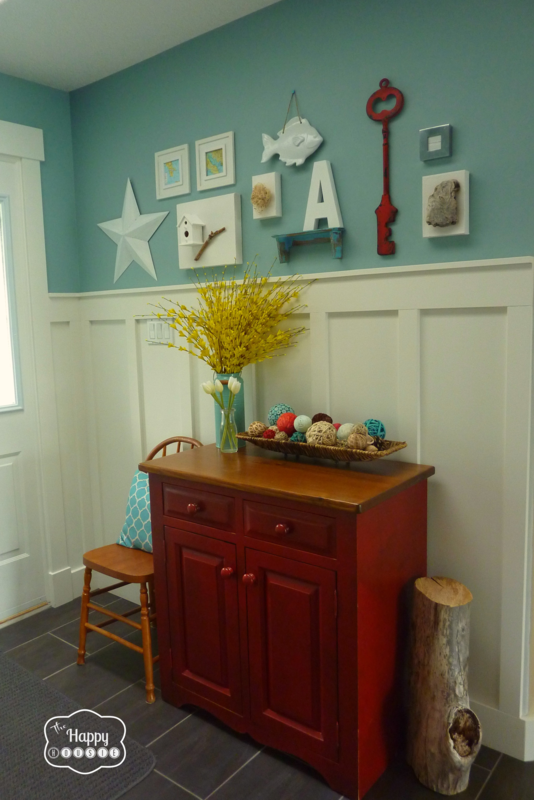 I like how the brightens up the red cabinet (I had been growing tired of it before…). Thanks for your visit, hope to see you again. Can’t believe its the same space Krista!!! 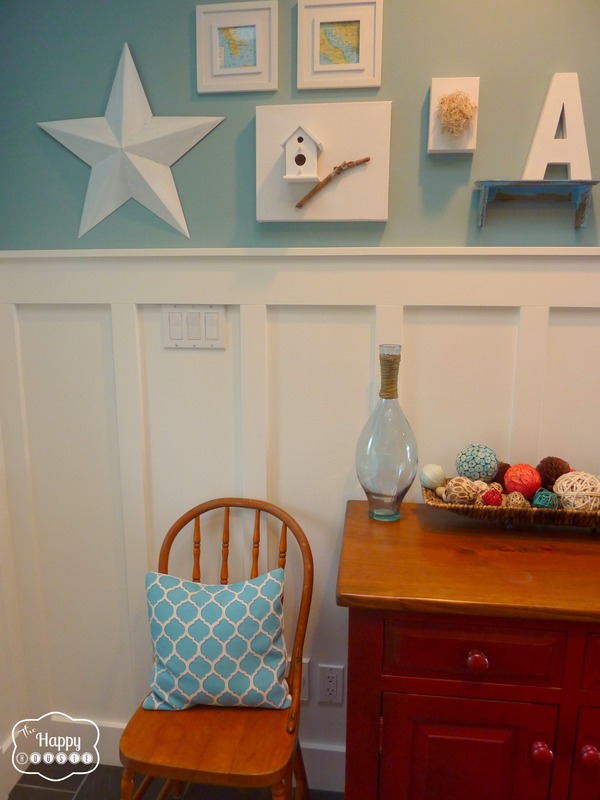 Love your wall vignette too, very cute, very you!!! Thanks Nancy… yes B&B does make a huge difference…doesn’t even feel like the same room anymore. 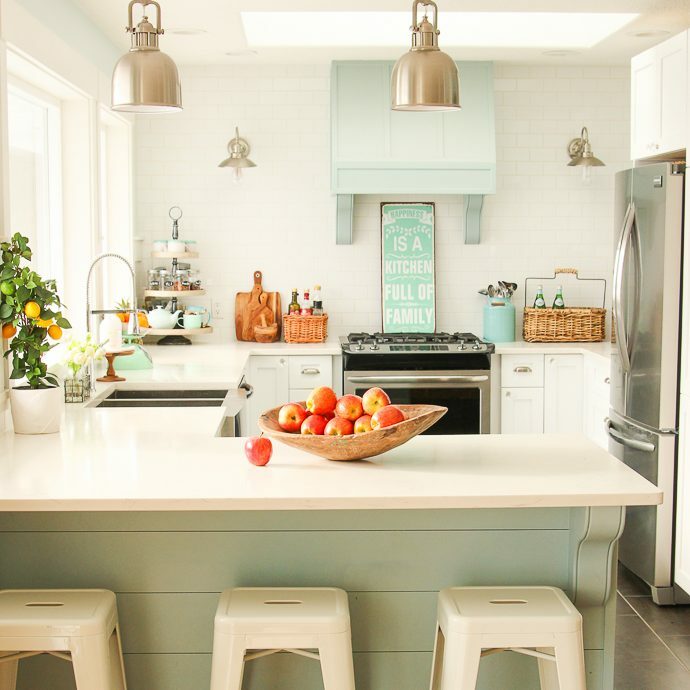 I think I will carry this wall color into the kitchen as well…thanks for your ‘vote’ – great ideas! looking good! love the gallery style wall! Stunning! Looks so classy and yet shabby but….it is awesome! Thank you for the inspirations. Hi Nancy! Glad to inspire:) Thanks so much for visit, hope to see you again! Hi Nicole! Thanks for your kind comments. So thrilled to have you following now, I will definitely go over to your blog:) Nice to meet you! Hi Marcy! Thanks for your ‘vote’ in my favour!! I love those forsythia branches too. It is my favourite flowering shrub because it is the first thing to bloom after a long grey winter – a promise that spring is around the corner. Good luck with your project! I will be posting a how-to on board and batten soon as well. Love the board and batten. We have some in our entry as well. 🙂 It goes so well with your existing trim. Thanks Anu! 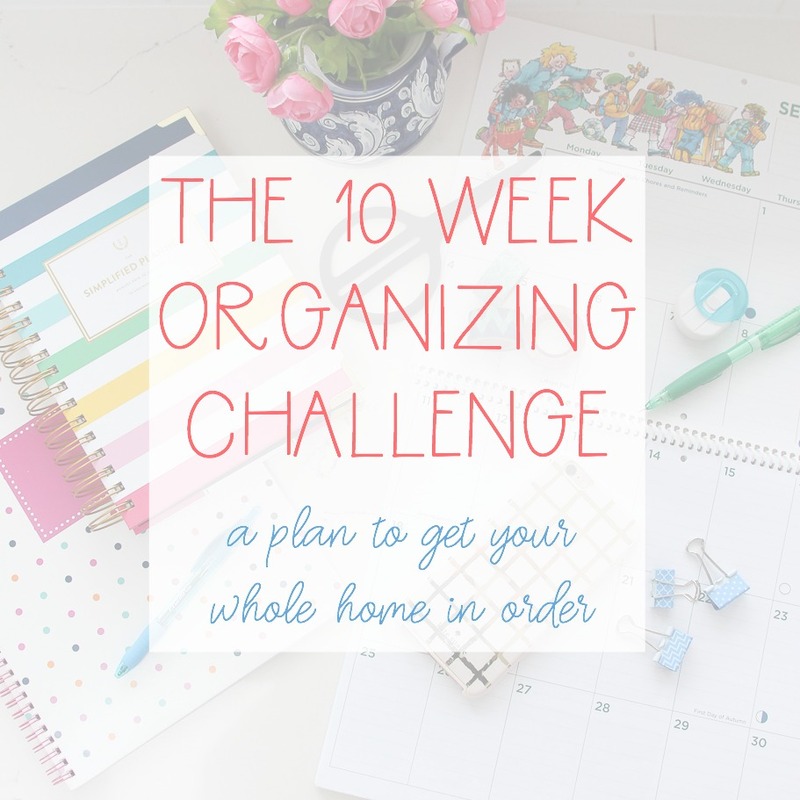 I remember your entry, I think it was the first post that brought me to your blog – it has such a fun fresh crisp organized look! Looks great! I especially like the way the red accents pop against the wall color. Love that wall color. I vote for a yellow door and chair. Can’t wait to see what you decide. Hi Courtney! So far everyone is on board for the yellow door so it seems it will be a go… think I have a fun plan for the chair too:) Check back soon! Thank you Mandy! So glad you came by! Wow! Talk about gorgeous!! Coming over from Suburbs Mom. Hi Krista, what a great transformation! Definitely a new rug and I love the idea of a yellow door. I am having a “yellow phase” at present and keep looking around my house for things to paint yellow. I, too, find that husbands have absolutely no vision and cannot imagine what a finished project will look like. Ah the joys of sharing a house with a decoration-blind person! It looks absolutely fabulous! Great job! I LOVE the colors! It’s fresh and inviting. 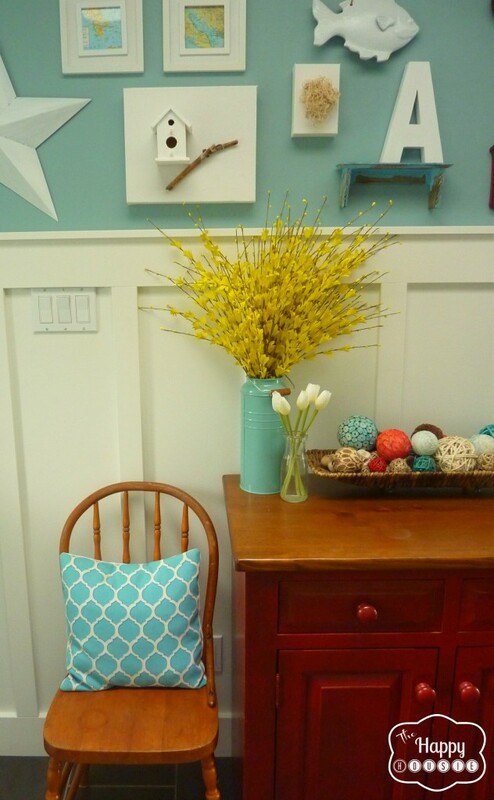 Love the red cabinet and the yellow flowers add a great pop of extra color. As for your chair, it really works with the finish that it is now, because it matches the top of the red cabinet. Great job! Thank you!! I agree, the chair does tie in with the top of the cabinet… I think I have a plan for a way to incorporate that WITH a paint color… Stay tuned!! Thanks for your visit! I love the tall wainscotting and the colour you chose above. Hi Ingrid! Thanks! I think the yellow would look nice too… if it doesn’t I guess I can always repaint:) I think I have a plan for the chair now.. a bit of a twist. Oh! can’t wait to see the twist! I’m sure it look great! 🙂 Hope you are having a wonderful weekend! I hope the “twist” works out Ingrid! Hope you have a great weekend too!! I vote peacock blue chair and yellow door. It looks great Krista! Krista, that looks great! I love the wall color against the white and the pop of red from the cabinet! Thank you Manuela! I love the way it ‘pops’ now too…so glad that you came by today! Hi Krista! This is my first time visiting. I love your new wall. I think coral would be a fun color for your chair and maybe leave the door white and get a fun striped color rug! I love all the gallery wall too. I also wanted to stop by and say thank you for visiting my blog. I am offering a giveaway right now for an enamel numbered sign which I think would look great on your wall. 😉 You should come enter! Have a great weekend!!! Your hall looks great! 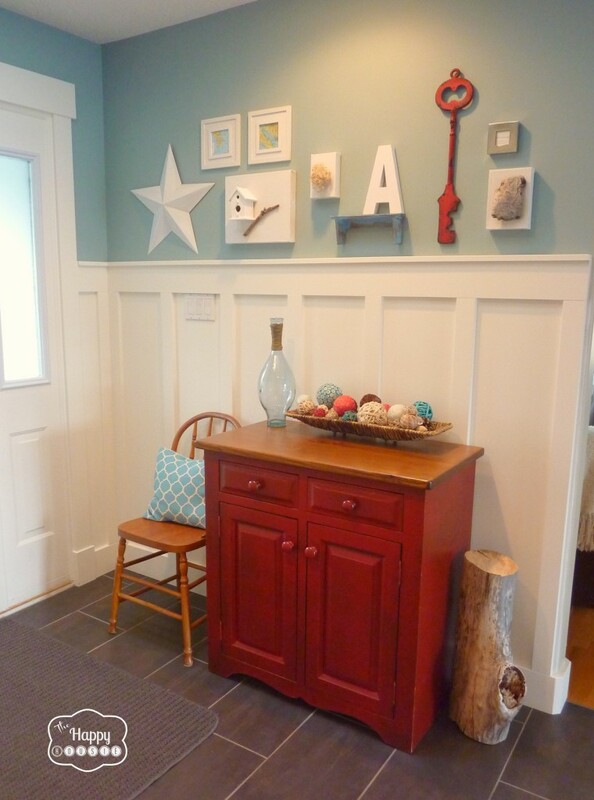 I really like the red cabinet against the white board and batten with the blue accents. 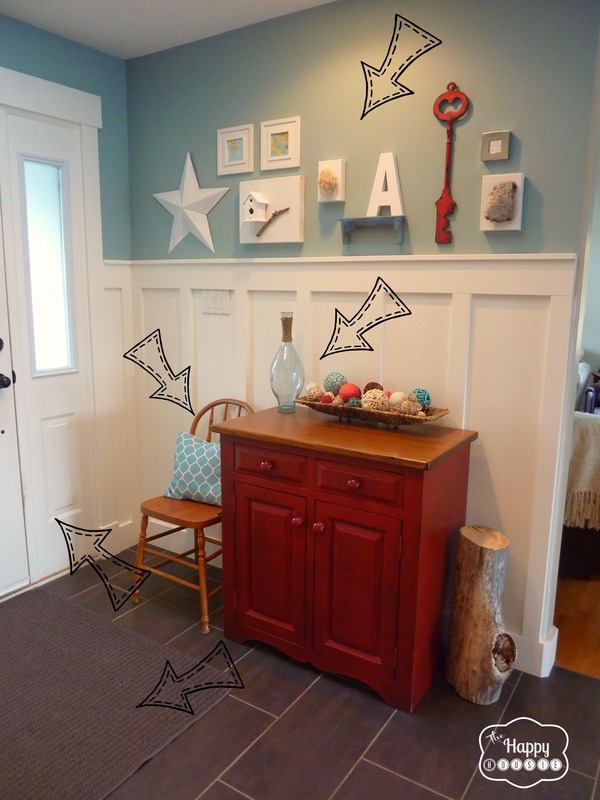 Your space is so much lighter now and certainly has more personality! I absolutely love it. So. Much. Better. I really love the color palette you have chosen. So bright but mellow. How long did it take you to do the board and batten? 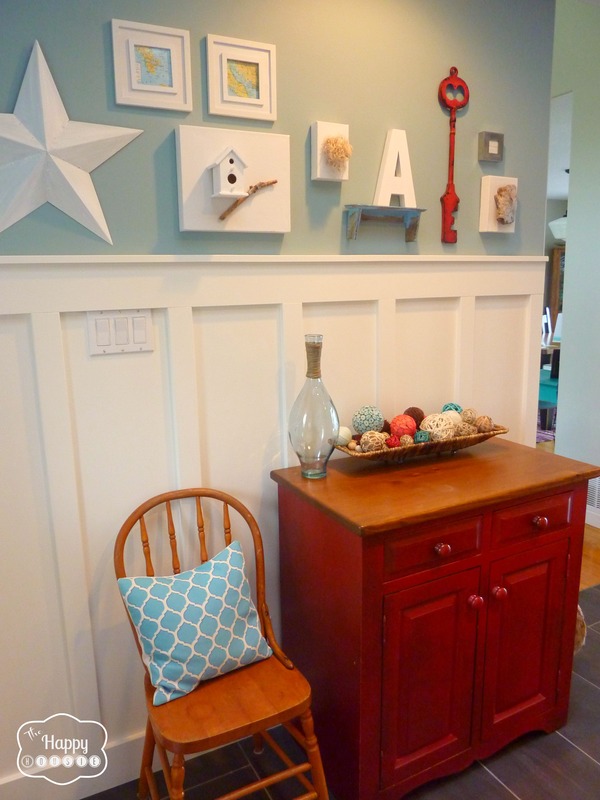 I am thinking about doing something similar to this and adding the hooks you used in my living room entry. I just have to find a new color for the walls. As far as your questions go my ideas would be to paint the chair either green or a bright blue. I love the idea of the door being yellow. A bright fun rug would tie everything together. Try Urban Outfitters they have some really fun rugs for good prices. I’m so excited to see what you choose to do. Good luck! Thanks Stephanie! I will check Urban Outfitters out…I think green or bright blue are great ideas for the chair. I will do a tutorial soon on board and batten – installing it doesn’t take too long but there are definitely finicky after steps with filling/dapping it to make it look good that take a little while. Depends upon how big an area you are doing. LOVE! You have such awesome design skills. It’s so pretty! Thanks for sharing at Pinworthy Projects. I love the board and batten Krista, It’s so gorgeous. Yellow would be perfect on your door. I’m sure you’ve seen Dash and Albert rugs, they have so many beautiful ones that I think would fit perfectly into your style. Hmm the chair is a tough one. I definitely think paint it…maybe one of the colors that is in the little map art on the wall would be fun. Hi Maria! Glad you like the idea to use yellow:) I will check out the Dash and Albert rugs… and I think looking at the maps for a colour is a great suggestion, thank you! Wowza! 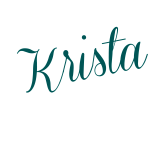 This is beautiful, Krista! 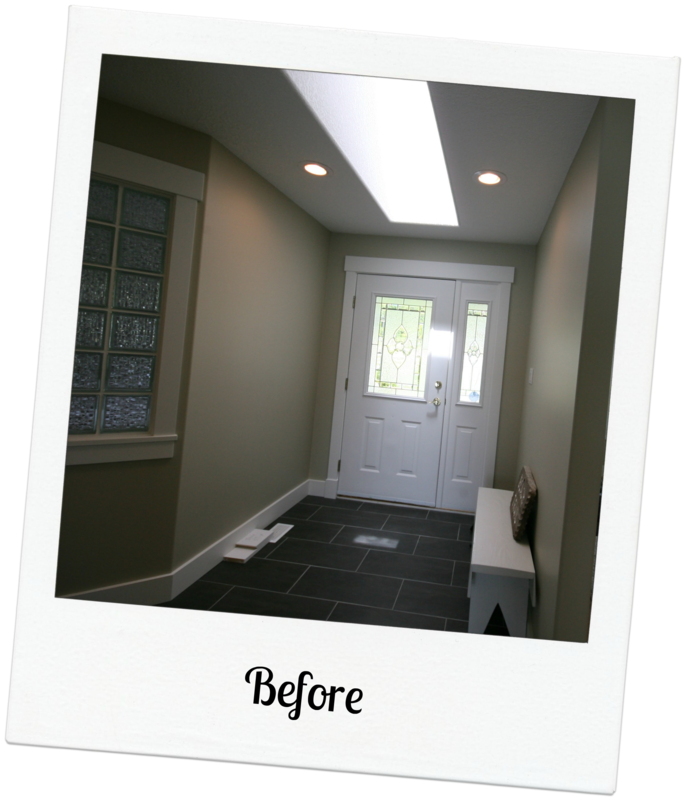 I love how light and bright your entryway looks now! Where did you get that key? I vote to paint the chair white or a green that is close to the green in the maps you’ve framed. You guys did a great job! Love it! Thanks Tara, they key is actually from a store we have locally called Home Hardware that has some fun housie types of items… I have seen it at a little boutique as well so I think they are “out there”. I thought white would be fresh but would it blend too much? I am considering green but I don’t want to make it look like Christmas… hmm I will check out the maps – good idea Tara!! Krista, this looks SO great! 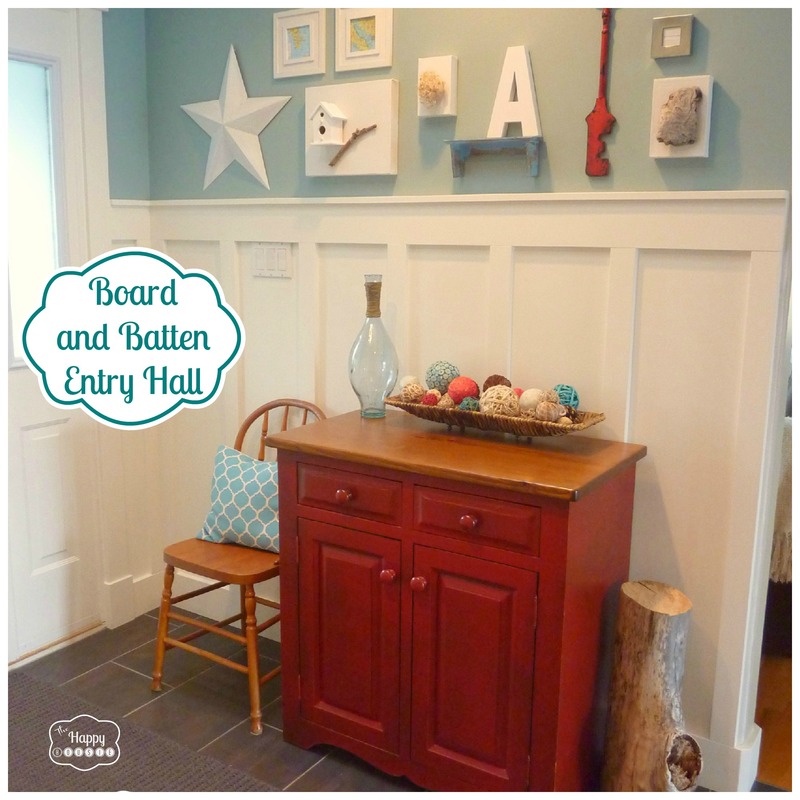 I love board and batten! It really lightens the space up and adds lots of character! Great job! Hope you have an awesome weekend!